Turn your yard into a bird feeding oasis with this Perky-Pet Squirrel-Be-Gone III Wild Bird Feeder. It attracts everything from cardinals, finches, flickers, and grackles to grosbeaks, jays, juncos, and kinglets--even sparrows, wrens, and woodpeckers. 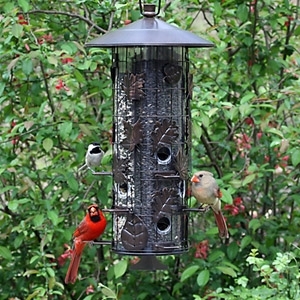 Best of all, this wild bird feeder provides an optimal feeding station for birds--without catering to those sneaky squirrels.